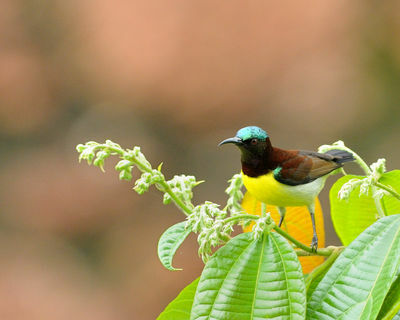 The sunbirds and spiderhunters make up a family, Nectariniidae, of very small passerine birds. The family is distributed throughout Africa, the Indian Subcontinent, Southeast Asia and just reaches northern Australia. Most sunbirds feed largely on nectar, but also take insects and spiders, especially when feeding young. Flower tubes that bar access to nectar because of their shape, are simply punctured at the base near the nectaries. Fruit is also part of the diet of some species. Their flight is fast and direct on their short wings. The sunbirds have counterparts in two very distantly related groups: the hummingbirds of the Americas and the honeyeaters of Australia. Some sunbird species can take nectar by hovering like a hummingbird, but usually perch to feed. The family ranges in size from the 5-gram Black-bellied Sunbird to the Spectacled Spiderhunter, at about 45 grams. Like the hummingbirds, sunbirds are strongly sexually dimorphic, with the males usually brilliantly plumaged in iridescent colours. In addition to this the tails of many species are longer in the males, and overall the males are larger. Sunbirds have long thin down-curved bills and brush-tipped tubular tongues, both assist in their nectar feeding. The spiderhunters, of the genus Arachnothera, are distinct in appearance from the other members of the family. They are typically larger than the other sunbirds, with drab brown plumage that is the same for both sexes and long down-curved beaks. How many different ways can you paint a bird (or a fish or a flower or…). Our God’s designs are truly magnificent. We have stayed there and the proprietors are avid photographers and birdwatchers. Got some fabulous shots, including some of the best I’ve seen of the Yellow-bellied Sunbird. There is a list at the bottom of that page of the species they have identified.